Satisfy the mind of any seasoned creative with this spectacular addition to the Ted Baker Premium Pen range, offering a unprecedented delve into the luxury of writing tools and reinstating the art of using a fountain pen. This fountain pen offers high class with a touch of designer magic. 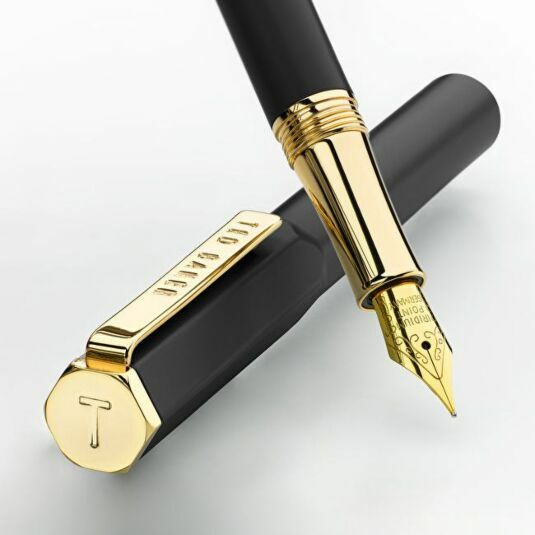 The pen itself offers a sleek design, with cylindrical bottom leading smoothly into a hexagonal shaped pen lid, topped with the signature Ted Baker ‘T’ logo upon a bold gold backing. 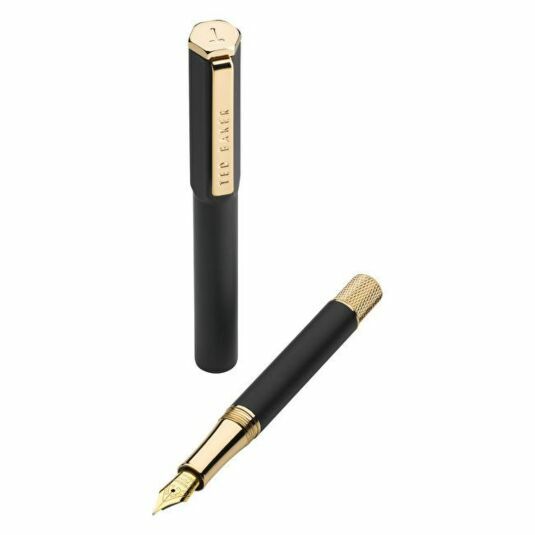 The writing element of the pen is revealed in a beautifully unique way, as the bottom half of the pen unscrews to reveal a luxurious gold plating, flowing from base into nib of the pen. The nib is made from a hardened iridium metal, meaning durability is at the forefront of its use, and once combined with the golden colouring, creates that true sense of elegance whilst writing. This fountain pen operates using individual ink cartridges, of which 1 is included, to provide an authentic means of stunning written design. Such ink cartridges can be easily sourced from any stationery stockist, meaning the life of your Ted Baker Fountain Pen can live on as your mind creates evermore brilliant content and ideas. 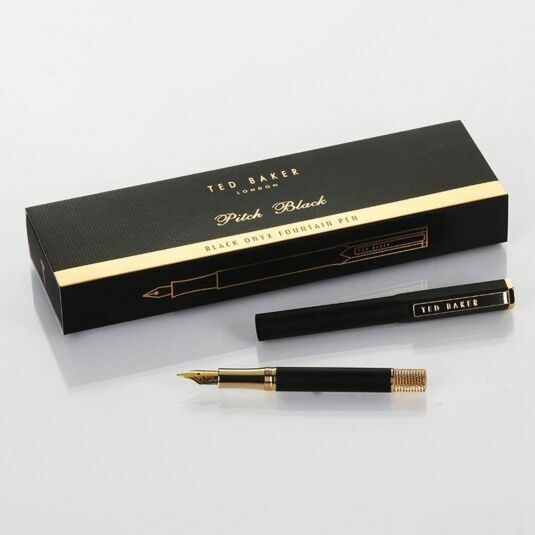 Ted Baker has thought of everything in this pens design, even through to its presentation, with this fountain pen stunningly housed within a matt black and gold detailed gift box, with the Ted Baker logo printed in a gold colour and the words ‘Pitch Black’ positioned below. On each side of the box, an outline of the pen is delicately drawn whilst each end features the signature ‘T’ from Ted himself. Simply slide open this magnificent box and reveal something of everlasting beauty that no doubt everyone will fall in love with. 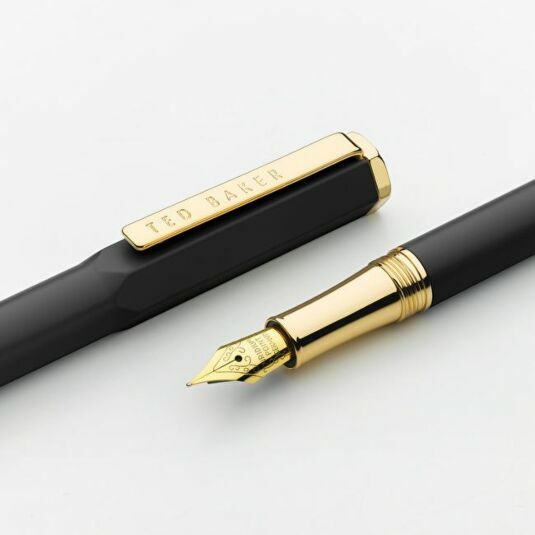 Allow the expression of true creativity in absolutely anyone, in the most luxurious of means with this Ted Baker Black Onyx Premium Fountain Pen, the most beautiful writing tool to inspire, create and imagine with, made by the man behind a world-renowned brand. 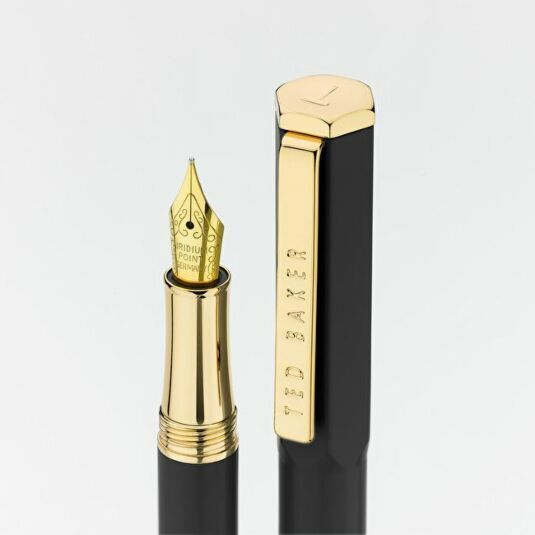 This fountain pen would make a sentimental gift for birthdays and Christmas whilst also for a graduation, retirement or leaving gift or as a heartfelt token of love for a student going off to university. This is a perfect gift for a discerning man, especially for Father’s Day or any special occasion. Ted invites you to delve into the sophisticated art of writing with his most elegant collection of pens yet, designed especially for the modern day creative. This collection of plated ballpoint and fountain writing tools feature in an opulent range of metallic colours including rose gold, chrome and 24k gold, with Ted’s signature branding and ‘T’ letter embossing throughout.